U.K. Ethics Body Calls Editing Human Embryos "Morally Acceptable"
But at least one other expert calls the process "a total disgrace"
The Nuffield Council on Bioethics says in a report that parents looking to “influence the genetic characteristics of their child” could turn to DNA editing – creating designer babies. The wording could influence a change in current law which dictates that scientists may genetically edit human embryos for research purposes, but must destroy them at 14 days. It is also illegal to implant edited embryos into a womb. The experts said that gene-editing would be used mostly to cure catastrophic diseases, or remove genetic predispositions to cancers and dementia, but the team didn’t dismiss the idea of parents using the technology to choose their child’s height, eye color, and other features. An embryo could even be edited to make the resulting child more intelligent, boosting its chance of future success in life. The council’s judgments have been the driving force behind the legalization of other controversial procedures, including 3-parent babies, in which the DNA of a “second mother” is used to replace faulty code within the cell. With the influence of the council, the law was changed to allow 3-parent babies, and the first ones are expected to be born later this year, or in early 2019. The council’s past decisions have been controversial, but leaving the door open to designer babies has drawn disgust and outrage from other experts who insist that allowing parents and scientists to “build” their child like a Lego kit is contrary to the council’s own guiding principles. And it makes no sense that people won’t eat a genetically modified piece of fruit, yet they’re open to allowing scientists to tinker with their future children’s DNA. It is, after all, a relatively new and imperfect science, and if something goes wrong in the process of editing a human embryo, the results could cause lifelong suffering, even death. 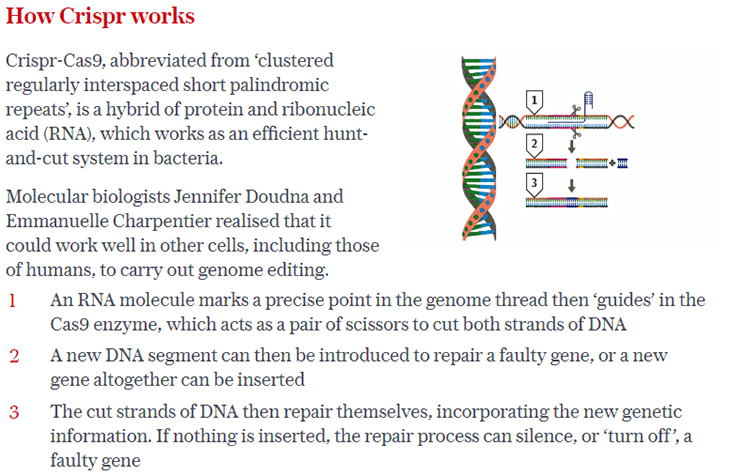 In the process of snipping away unwanted DNA, it is possible to make an imperfect cut, or to cut away too much genetic material. And if scientists are allowed to progress to introducing changes to the germline, in which DNA edits would be passed down to future generations, the ramifications of a mistake will be felt by entire families.